The scene at halftime in the Sixers' locker room Monday night was intense, the language was unvarnished and the message was impossible to misconstrue. "Coach really got into us," Tobias Harris said after the Sixers' 145-123 win in Game 2 of their first-round playoff series against the Nets (see observations). "It was fiery." Boban Marjanovic, Mike Scott and James Ennis all said it was the angriest they'd seen Brown since joining the Sixers. "It was great," Scott said. "We needed to hear it. Some lazy plays defensively, myself included. Yeah, man, get them off the three-point line. I think that third quarter we came out and played hard defensively." Brooklyn, down just one point at halftime after shooting 10 for 23 from three-point range, went 0 for 6 from beyond the arc in the third quarter. The Sixers scored 51 points in the period, tied for the most in a quarter in NBA playoff history, and held the Nets to 23. After a Game 1 in which just about everything that could have went wrong did, the Sixers could do no wrong in the third. Jimmy Butler, not one to shy away from confrontation, was a wholehearted supporter of Brown's approach. "OK, Brett, I see you," Butler said with a grin. "Yeah, he came in here and said a few cuss words. Shocked me a little bit, to tell you truth. But I like it. That's that type of energy I love. Just make sure everybody did their job, letting them know you can't have it - it's not winning basketball. And we came out here and did what we were supposed to do." Brown couldn't have asked for a better response to his fire. "I thought that defensively, the way the team came out and responded to some first-half stuff that I thought we needed to fix, was a fantastic statement," he said. 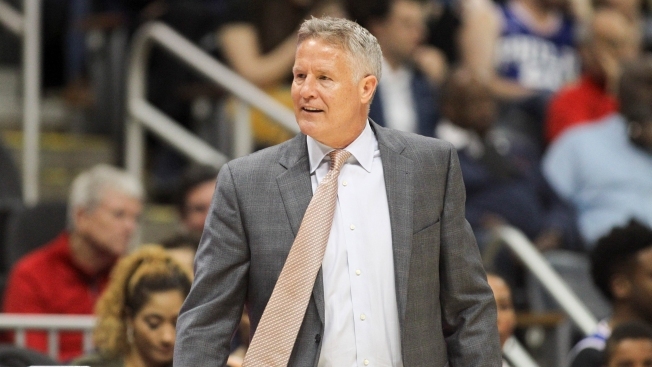 The Sixers evidently needed a reminder that long twos, not open threes, are "the sword they're willing to die on," as Brown is fond of saying - that's the tactical element of Brown's message. But, judging by his players' reactions, you sense what Brown had to say was much less about strategy than effort and accountability. "I love that s---," Butler said. "I love when people get cussed at, yelled at and say, you know, ‘You can't do that, it's your fault.' I'm all for it." Speaking before the game about Joel Embiid's sore left knee and the concern over whether his star center would play, Brown said, "I'm numb to it." He understood how much the Sixers' fate revolved around Embiid's availability, but, with Embiid's health a recurring question, the situation didn't especially perturb him. Brown's anger, though, is not something the Sixers are numb to. He saved his fire for a fitting occasion, with his team playing well below its potential and possibly sliding toward a 2-0 deficit to a less talented team. "That's always good," Scott said. "Cuss us out, light us a fire - that's good basketball. I'm a fan of that."